Our friends at Zee and Zoey decided to set up a day to remember all our friends who have gone to the Bridge. They lost their cat Mr. Jazz just last year on this day and while they are still grieving wanted to share the day with all those that have experienced loss....as we all have. Deb even wrote a book called Purr Prints of the Heart in honor of Mr. Jazz. You can join the event on facebook too. We have lost several members of our family over the years....and fosters as well. 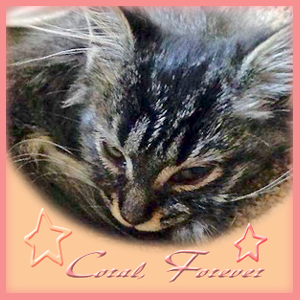 But last year was hard when Maestro crossed in May and then we lost baby Coral in October. And while they are gone from this world, we know they are healthy and safe and we will be together again someday. Hugs to you for sure. Coral was a sad deal. But Maestro was not easy either. It is just way too hard to lose our fur friends. Have a great day. (((hugs))) and purrs as you remember all those who wait at the Bridge. Thinking of you today and sending purrs...It's so difficult to lose our fur children and companions, even though we believe they're always with us in spirit. Love and hugs to you as you remember your beloved Maestro and Coral. Thank you for sharing them with us. What a beautiful day it will be when you are reunited one fine day. Hugs and purrs on that special day. Thanks for sharing your sweet kitties. Remembering your sweet kit-cats today! Purrs to you on this special day. Those of us who rescue and foster have so many more losses but each one was unique and is forever remembered. Hugs. Very nice tribute to Coral and Maestro and all those you have lost. This has been such a special day remembering our beloved pets who live forever in our hearts. 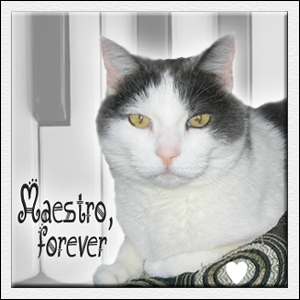 We is sending our purrs as you remember Maestro and Coral. We all deal with grief in our own time and way. I feel emotions so deeply that I have to move forward through grief with happy thoughts in order to survive. My fur children will always have a special place in my heart. How wonderful we can have a day to remember our fur children who've gone before us. We stopped by Friday but we were too sad to leave a comment. It's wonderful you had Maestro and Coral, as well as others that came before. They leave such happy memories with us.